Rachel Von | The Journal Gazette ECHL MVP Shawn Szydlowski led the league in scoring with 79 points, including 31 goals and 48 assists, and was second in the league with a plus-39 rating. Shawn Szydlowski may not have been voted the Komets' MVP – that honor was given to Gabriel Desjardins – but he was selected the Most Valuable Player in the ECHL by coaches, reporters, broadcasters and media-relations directors. The award was announced Friday – Colorado's Michael Joly was the runner-up, Manchester's Jordan LaVallee-Smotherman was third and Cincinnati's Justin Danforth was fourth. The Komets open their best-of-7 first-round playoff series with Cincinnati at 7:30 p.m. today at Memorial Coliseum. Szydlowski led the ECHL in scoring with 79 points, which included 31 goals and 48 assists, Cincinnati's Jesse Schultz was second in the scoring race with 75 points. Szydlowski's plus-39 rating was second during the regular season to Florida's Logan Roe's plus-43. 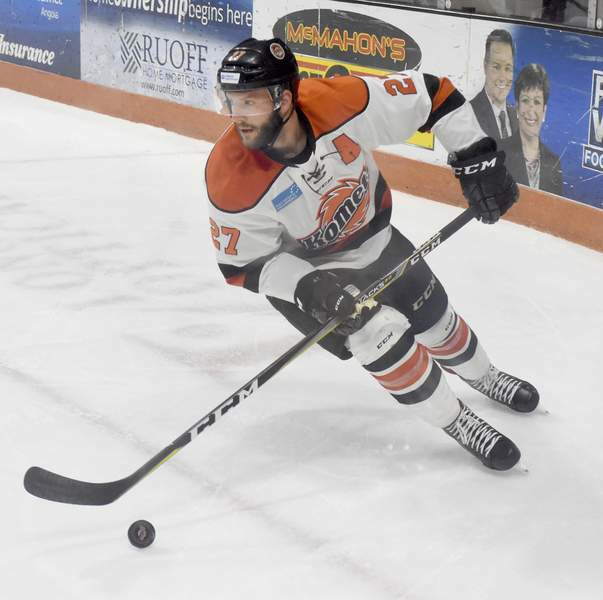 The Komets did have several valuable players, including Garrett Thompson, who was fifth in the league with 71 points, and Desjardins, who had a team-best 33 goals and 67 points. Szydlowski said he cast his vote for Desjardins for the team award, which was handed out Sunday at the Coliseum. This is Szydlowski's fifth season with the Komets and it's not the first time he'd been in the ECHL MVP conversation; he finished fifth in 2015-16, when Allen's Chad Costello won the award. Szydlowski had 75 points that season, which was his career best until this year. Szydlowski, 27, has played in 302 regular-season games with the Komets and totaled 131 goals and 323 points, while being selected MVP by his teammates in 2015 and 2016. In 45 playoff games, he has 20 goals and 45 points. He has twice been named First Team All-ECHL, in 2015 and this year, and he was a Second Team selection in 2016. He played in the 2017 All-Star Classic but didn't get picked this season; the Komets' spot went to rookie Artur Tyanulin, even though Szydlowski led the ECHL in scoring at the time.